I had some Healing Honeysuckle today. It sounded good to me because I’ve got another dang sinus infection. Anything to boost the immune system is helpful. Breathing in the warm vapor and drinking the hot tea is soothing to the raw tissues. Plus, it just tastes good! 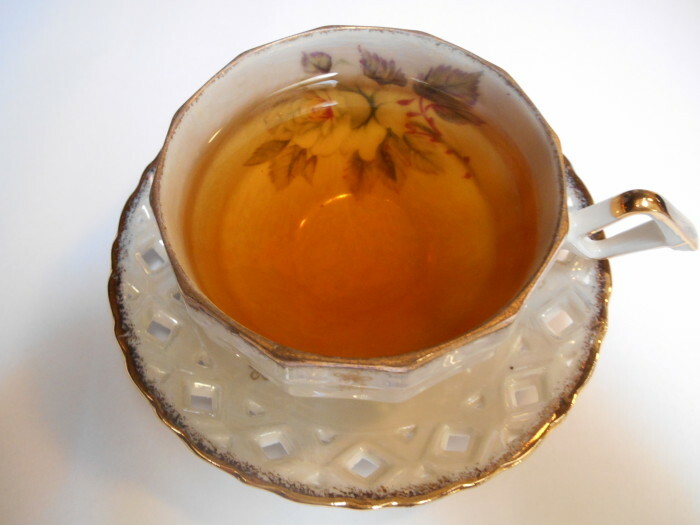 The liquor is a lovely amber-orange color and the tea has a very pleasing floral-citrus aroma. It is a very mild tea blended expertly by our friends at Piper & Leaf. 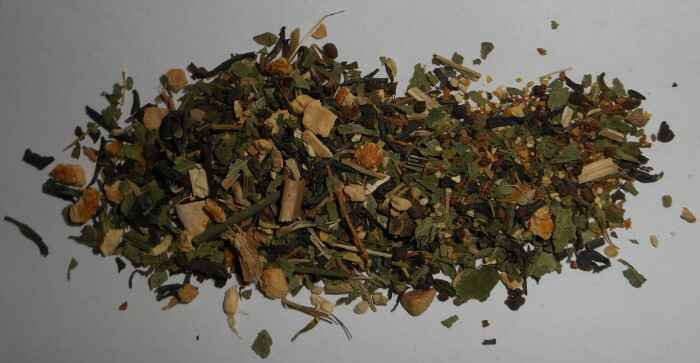 It contains Echinacea, Orange Rind, Jasmine, Lemongrass, Dill Seeds, Honeysuckle Blossoms, Oranges, Lemon Verbena, Mint, and a very small amount of Ceylon Black Tea. This is a smooth and flavorful blend combined perfectly for a mellow cup with the jasmine providing a nice floral after-note. WebMD says that echinacea boosts the number of white blood cells. Hopefully the echinacea is doing its job for me. I added some ginger honey for a little sweetness and additional healing benefits. No cold or flu necessary to drink this enjoyable tea. Good anytime! ← Take Tea in the U.K.
Oooh, what a lovely piece you’ve written here! Thank you for loving on our teas!!! Healing Honeysuckle was originally Caffeine-Free, with no added black tea, but recently and beyond our control, the Ceylon was added. We have a limited quantity left at the moment, and when it is gone, we will no longer be blending/carrying/selling Healing Honeysuckle. Our goal is to provide the best for our customers, and we feel the Caffeine-Free would be the best. We won’t sell you second best, so away it goes. Get some while you can!! Oh, and when you’re getting a cold, try adding it to your homemade chicken soup recipe. It brings a delightful “zing” to your stock!! Thank you for the information! I actually like it with the little bit of tea added in so I’ll definitely get some more soon!